I'm back from a whirlwind of activity in Freeport. 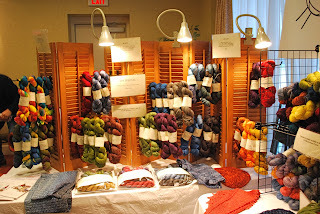 SPA Knit and Spin Weekend was a lot of work and loads of fun. For all the hours and weeks of planning and preparation it seems I blinked and the weekend was over. We set up the booth on Friday. It wouldn't have been New England in February without some wintery weather. It was nice to have a fresh coat to cover up the dirty snow. In just a couple of hours the space was transformed. Yes, that's a post right in front. 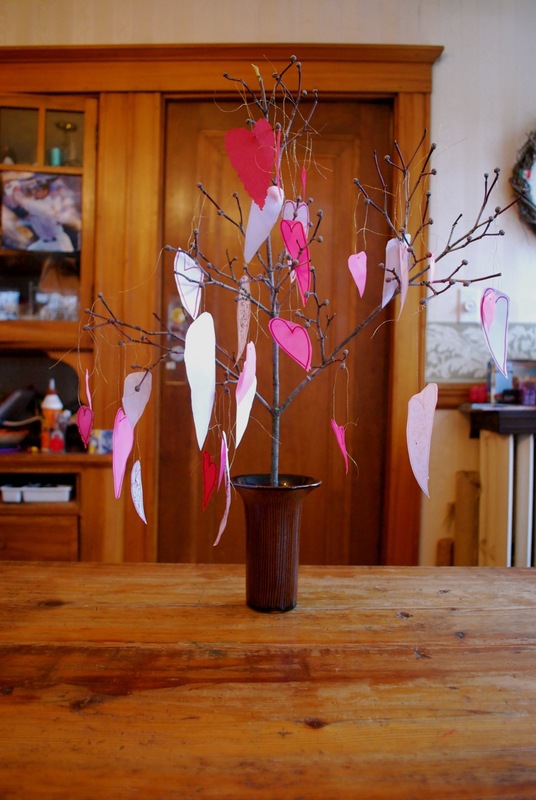 I worked around it and even decorated it with posters for a couple of upcoming events. New yarn, samples and kits. This was a petting station. People love to touch and feel. I tried to make the rounds and see as much as I could of the marketplace. There were so many wonderful things to look at - bags, yarn, fiber, notions, spinning wheels. Michele from Three Bags Full was there. It was her first time vending. 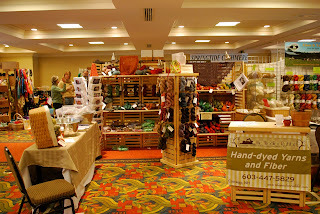 In the flurry of activity I didn't get a picture of her booth, but it was colorful and loaded with fun fabrics. It looked like she was having a good time. The greeter at the front door. Courtesy of Mountain Fiber Folk. 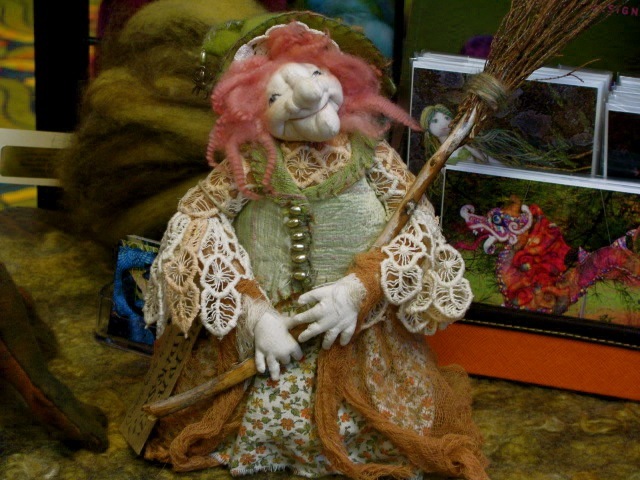 This enchanting figure, also from Mountain Fiber Folk, caught my eye. I'm amazed by the details - fingers, chin, hair, buttons. Such character and charm! 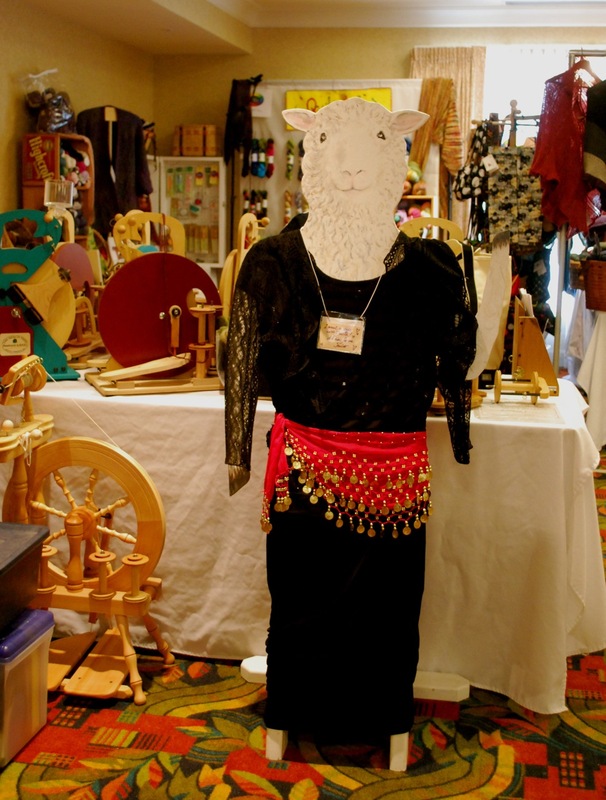 Knitters and spinners descended on the hotel and occupied every available space. I didn't knit more than ten rounds on my sock all weekend, but it was inspiring to be surrounded so much enthusiasm, passion and creativity. We did manage to escape the hotel and wander around town. It wouldn't be a trip to Freeport without a stop at L.L.Bean. It's Monday and back to reality. 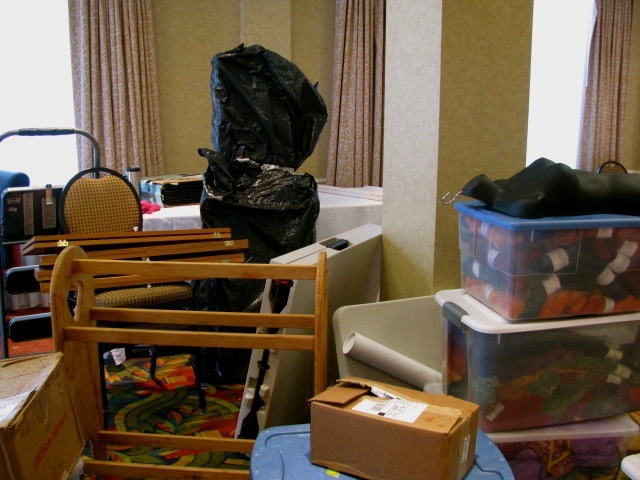 Time to take inventory, assess the damage and start re-stocking. My next event is less than two weeks away. I'm pulling everything together here before I hit the road to Freeport. I have one last sample that will be making the trek with me. 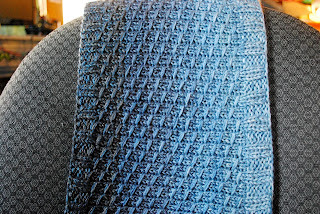 Dipped Infinity Scarf by Laura Chau. 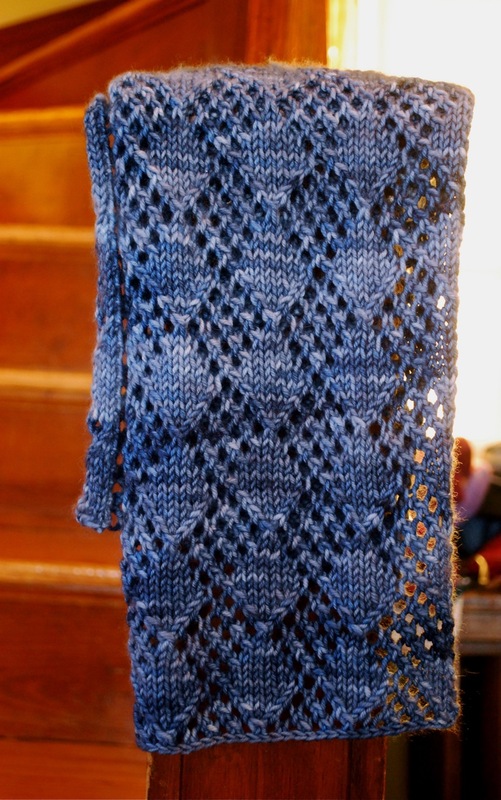 A dear friend knit this sample for me, and I'm delighted with it. So delighted that if I didn't have to pack I would sit down right now and start one for myself. 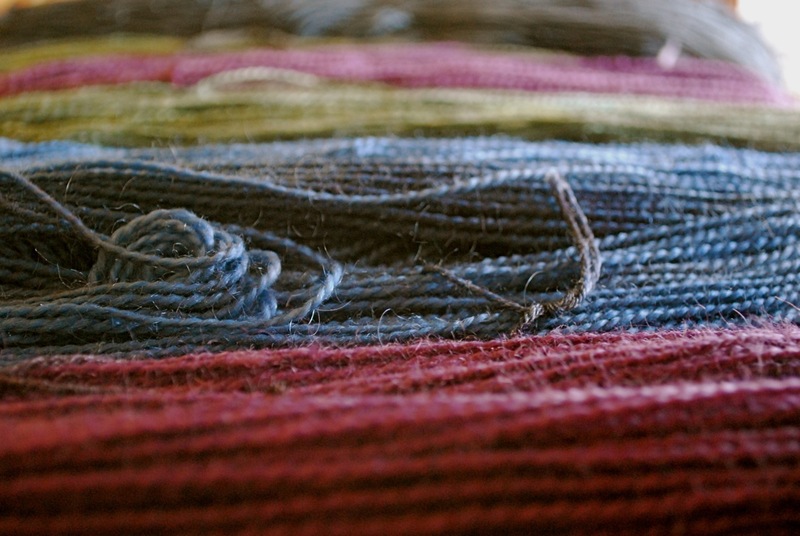 There are 8 different colors of Julia in this scarf, moving from dark to light. I will have this available as a kit. 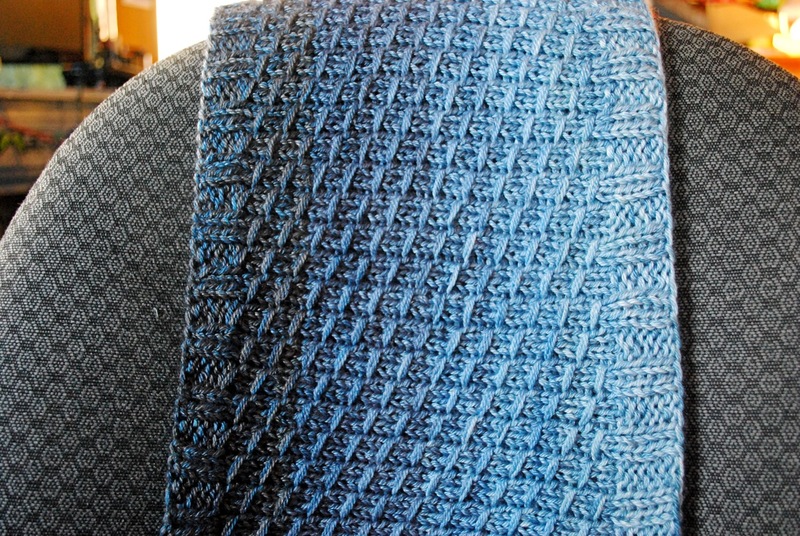 Knit this scarf and watch the colors shift - an entertaining, mesmerizing project. And now back to the task at hand. I'm in the final stages of getting ready for SPA next weekend. 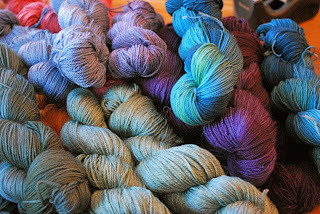 All the dyeing I did over the last couple of weeks created piles and piles of skeins. 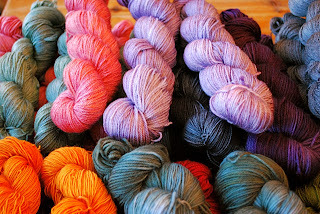 After the dyeing comes the labeling. I spent an afternoon labeling skeins. 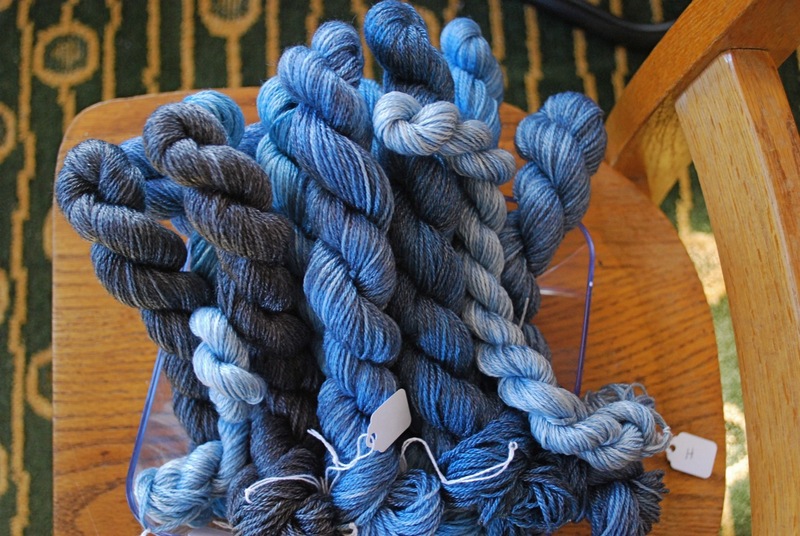 Just when I thought I was finished, I found more skeins to label. It seemed I would never finish. The job is done now except for a few odds and ends. 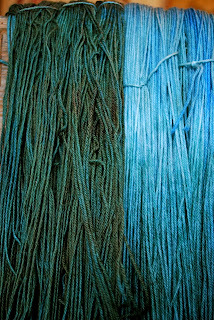 Two new colorways without names. They won't get labels until I name them. Even though there's more work to be done, everything is coming together. I'm in the home stretch. I've had an idea for one last booth sample so I took a few minutes yesterday to cast on. This is the solid color version of Diamondback Mitts. 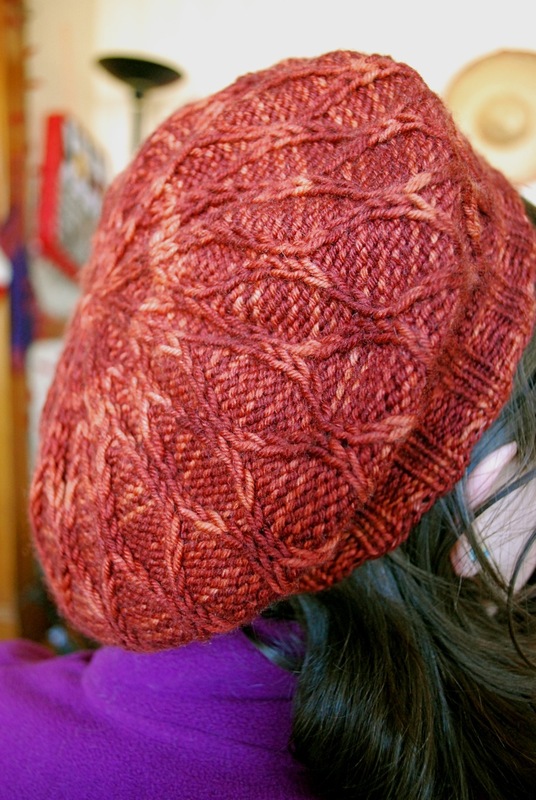 This is a quick knit, so I'm confident I'll have it ready for next weekend. All this weekend work didn't keep me from a field trip with a friend. It was the grand opening of a new shop in town. Their logo says it all - sewing and yarn. Virginia and her crew have created a delightful space. You'll find some great pictures of the shop here. I especially love the drawers of buttons. 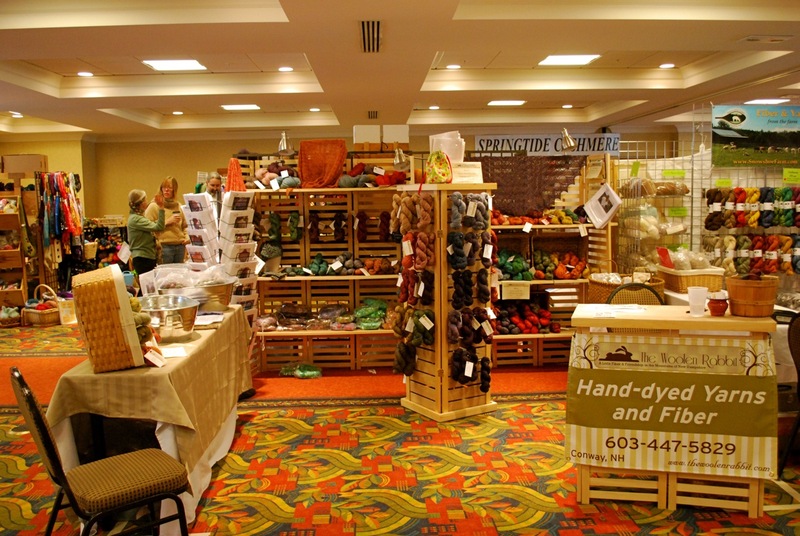 They have a well-rounded selection of yarn and fabric, needles and notions, patterns and books. I'm delighted to have this shop in my backyard. 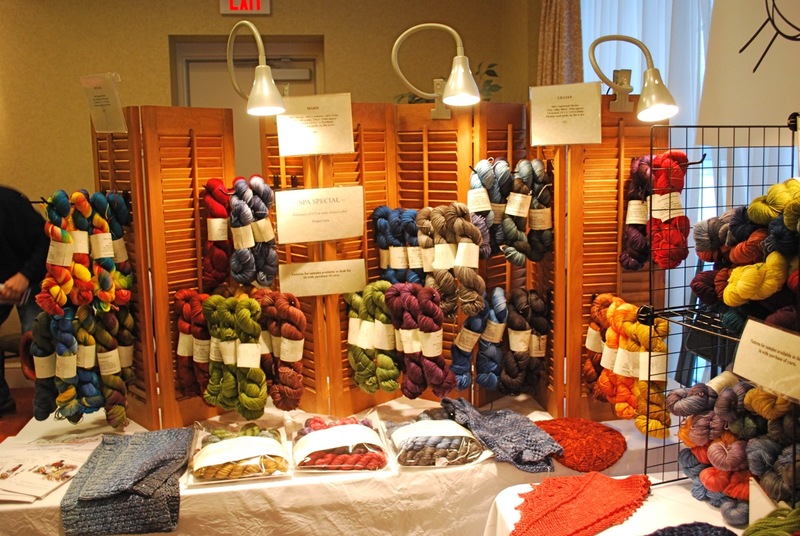 This time next week will find me at SPA Knit and Spin Weekend in Freeport, ME. For me it marks the start of another busy season with events almost every month from now through November. 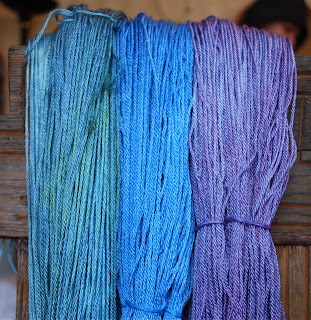 While I'm really looking forward to hitting the road, it means that most of my work time this week has been spent with the dye pots. 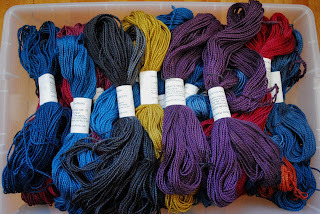 I started the week with a manageable list of dyeing that had to be done. As so often happens one thing leads to another. I was inspired with more ideas as I worked through my list, adding colors to the list faster than I was checking them off. Before I knew it, my list was twice as long as when I had started. And so it goes. Instead of fighting it, I rolled with it. It's been fun to make discoveries along the way. There's a new kit in the making. 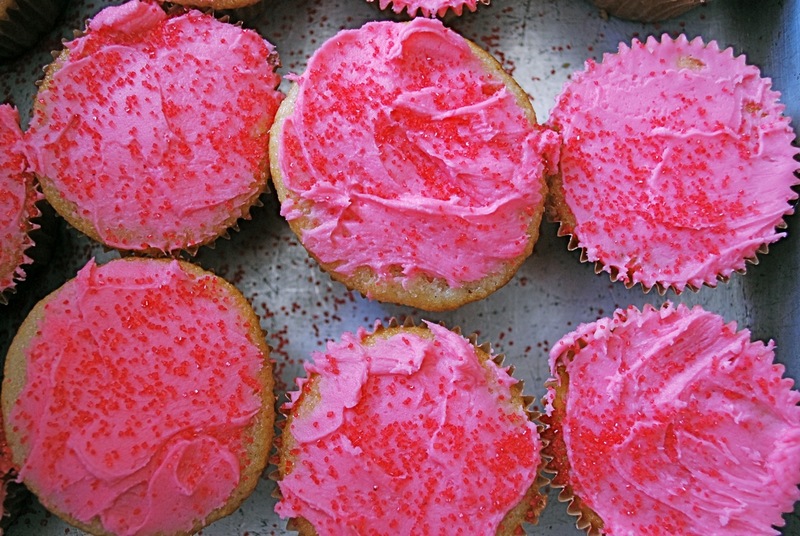 There are colors that herald the coming spring. This may be my new favorite color. 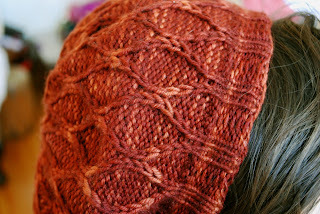 I think I'll have to give it a test knit this weekend. 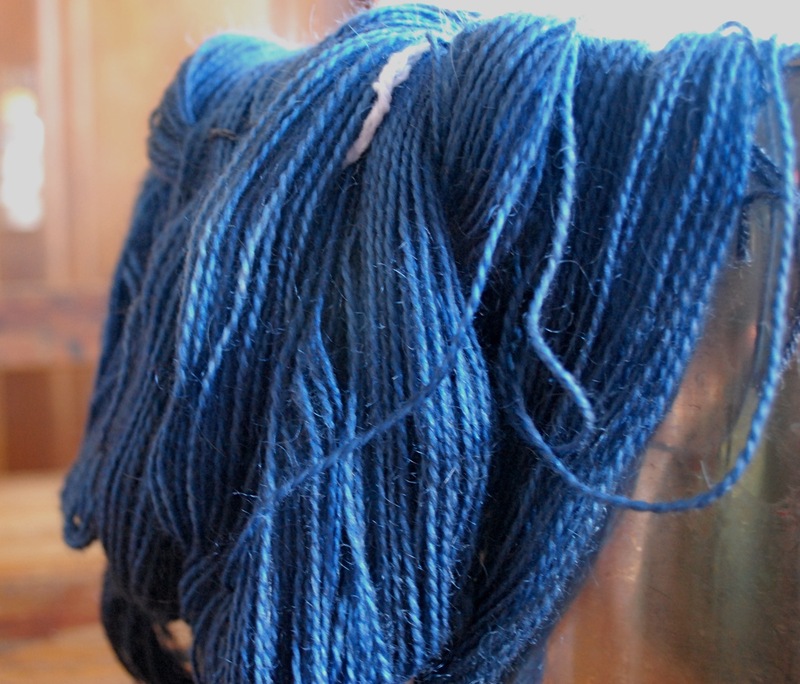 The whirlwind of dyeing is over. All that's left is the drying. And the twisting, labeling and packing. Still plenty of work to do. 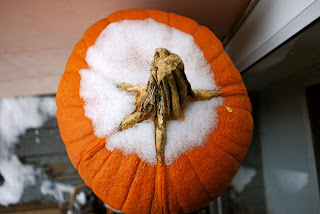 We had one lone pumpkin lingering from the fall. 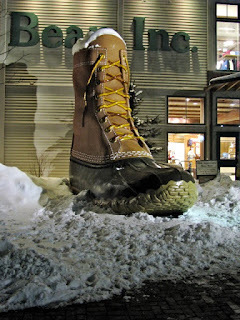 It was dusted with snow in a recent storm. White on orange is my color inspiration for the week. 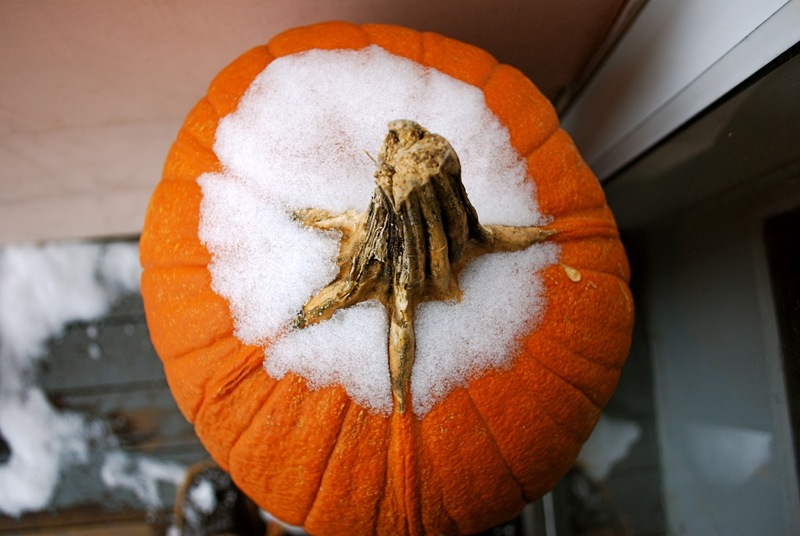 Pumpkin wrapped in a snowy shawl. Some of my best friends are my knitting buddies. 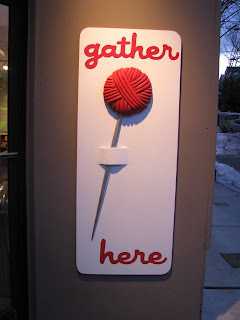 We get together regularly and share our passion for knitting - fun projects, new yarn, interesting techniques. We also share our lives with each other - what's going on with kids, families, jobs, health. We've been gathering for quite some time now and have shared many things, all the while knitting . 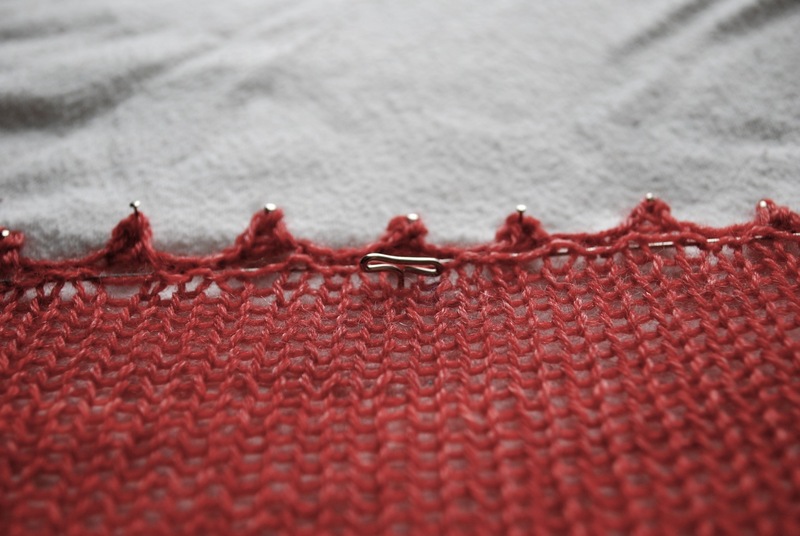 . . stitch after stitch after stitch. These friends have been very supportive of my business, always offering to lend a hand. 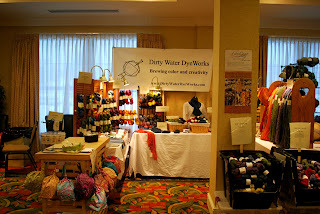 Wind yarn, label skeins, booth help, computer assistance, sample knitting, photography. Even if I don't need the help, the offer is always so touching. 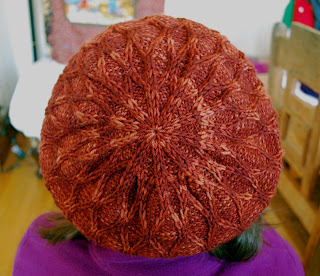 A couple of weeks ago one friend offered to knit a sample, and I took her up on it. Samples add so much to a booth, and with a show coming up I've been working to add a few new ones to the lineup. I appreciate that my friends use some of their precious knitting time on my behalf. It's very generous. We've created our own community and a strong support network. 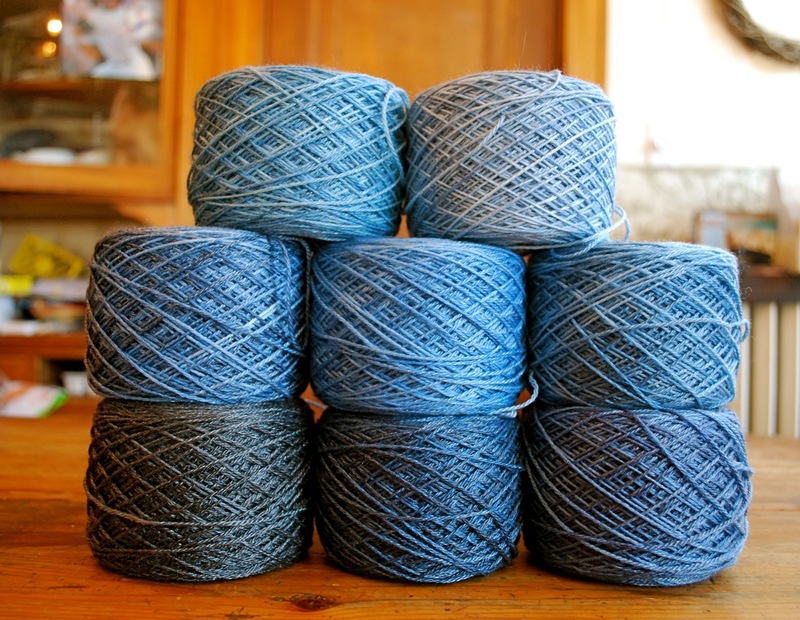 We help each other not only with knitting emergencies but also with other life emergencies that arise. Even if you don't need the help, it's comforting to know it's there. Just in case. This pattern is Breiwick by Gudrun Johnston. The yarn is Dirty Water DyeWorks Marie, colorway Cinnamon. 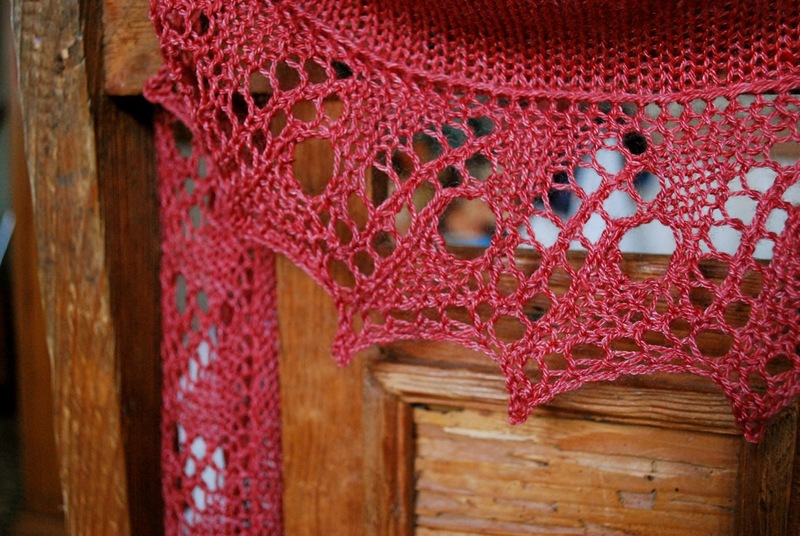 Over the weekend I finished Scroll Lace Scarf. After slogging through the border the body practically knit itself. This scarf is destined to be a booth sample. 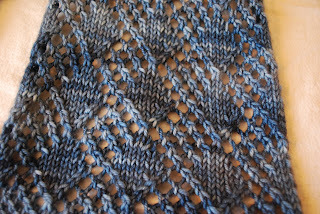 Do I knit anything else these days? I blocked it right away so that it's ready to travel with me next week. 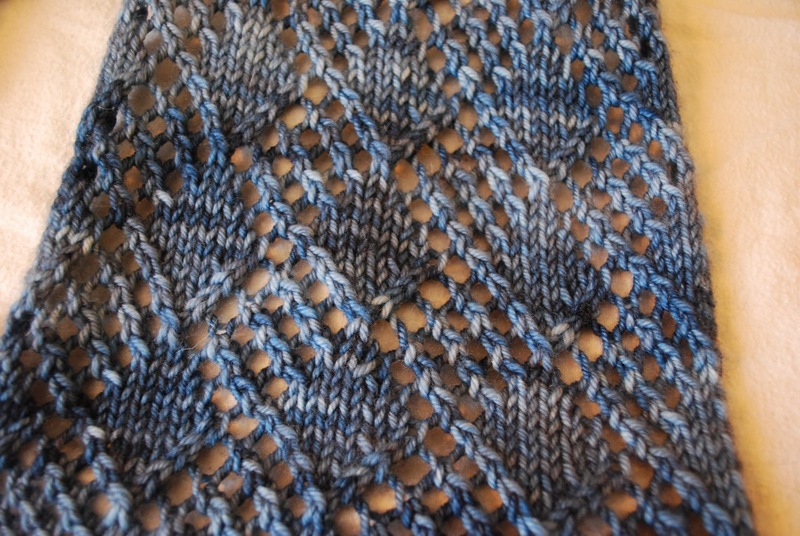 Each point of the picot edge was pinned out. 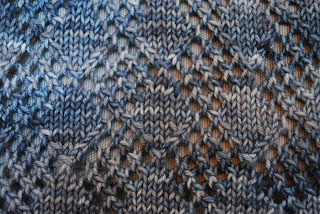 I appreciate this garment so much more after blocking. The elegance and drape make for a delightful accessory scarf. 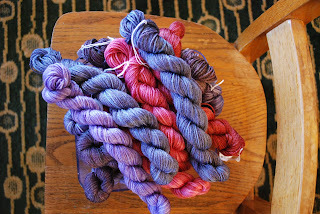 The yarn is Dirty Water DyeWorks Julia, colorway Pompeii Red. 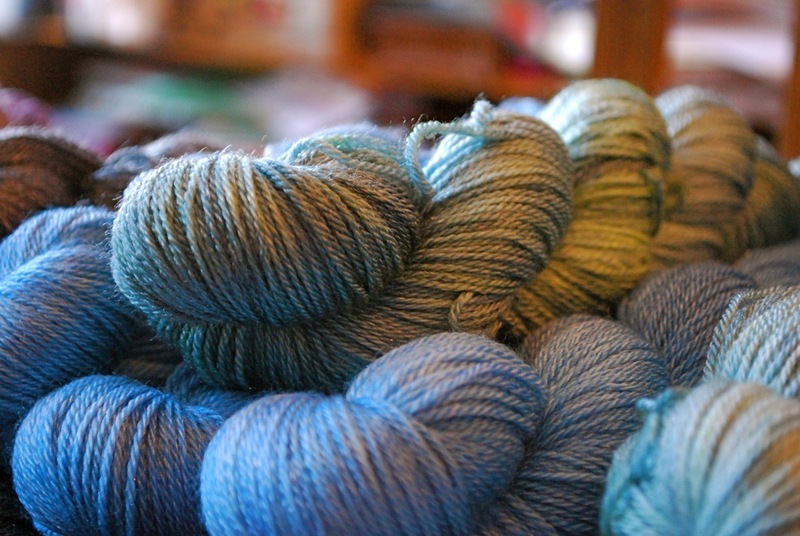 Julia is a blend of Superwash Merino and Tencel. The tencel gives Julia durability and a subtle shimmer that is so enchanting. Valentine's Day crept up on me this year. 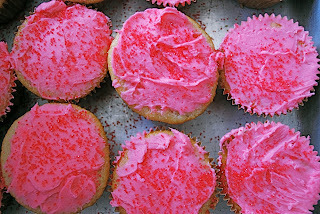 It's a good thing that others in this household have taken the initiative to mark the day. 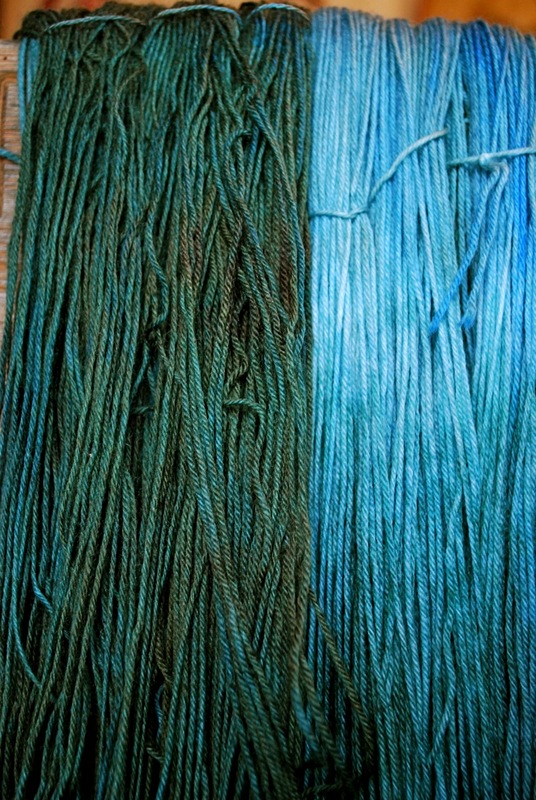 Sometimes with knitting projects you have to work through a not-so-much-fun section to get to the other side. Once you're on the other side, the project is suddenly oh so much fun. 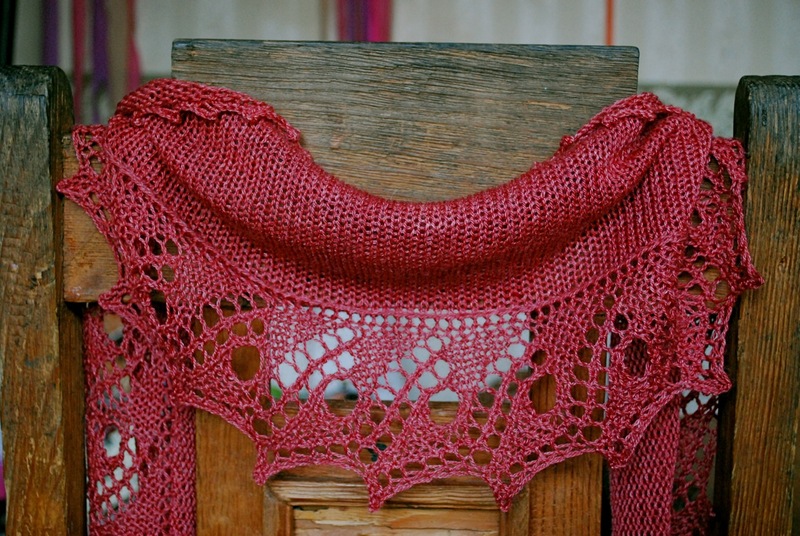 That's been my experience with Scroll Lace Scarf. This project starts with knitting the border. Now many projects end with the border. While the border can often go on and on for mind numbing hours, at least you've already had the satisfaction of knitting the body. There's a certain motivation to finish the border because, after all, the rest is already done. 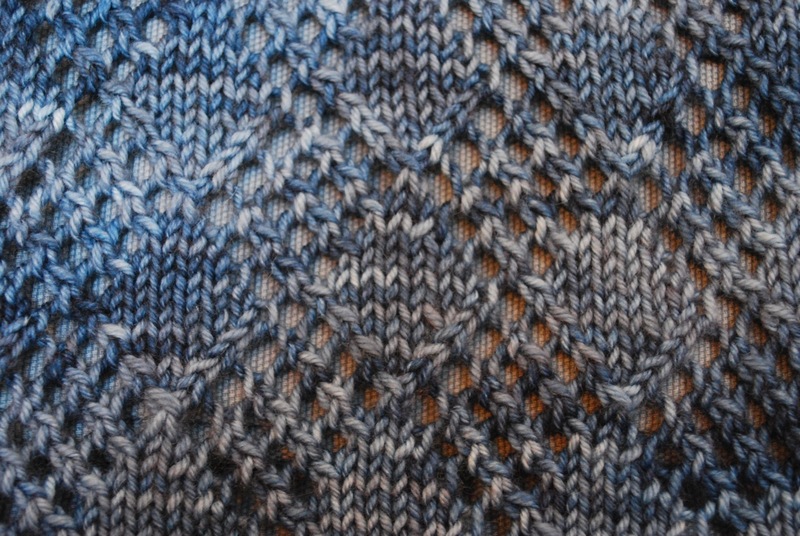 But when you start with the border there's always the temptation to abandon ship and scrap the project all together. 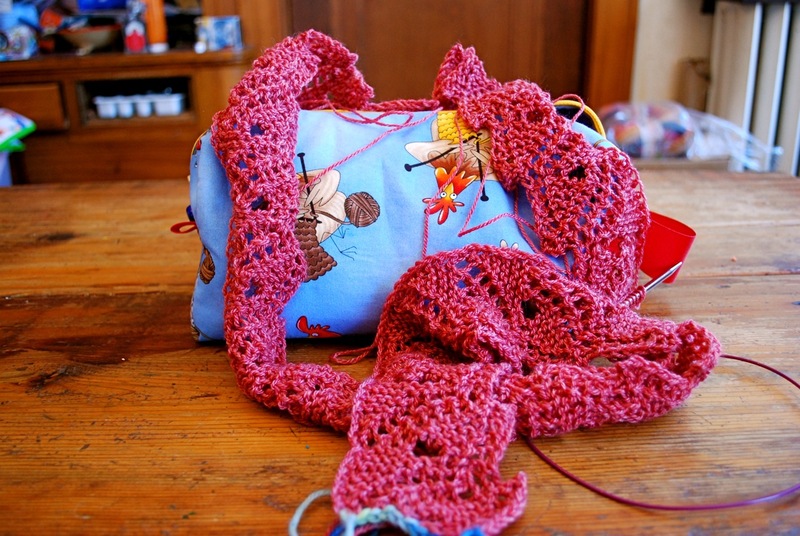 Toss it aside - there isn't the investment of time and effort into knitting the body. 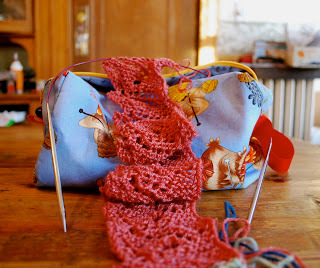 It often takes a bit more determination to finish the border and get to the body. While I didn't contemplate ditching Scroll Lace, I was really ready for the border to be finished. After 28 repeats of a 14 row pattern I had this to show. Plenty of border. 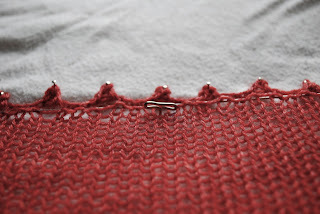 I picked up the body stitches along the edge and miraculously had the right number of stitches. It's so encouraging when that happens. 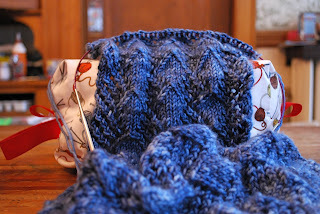 I settled in to work back and forth on all those stitches, and before long this little project was taking shape. That limp, lifeless border now has form and substance. This project has taken on a whole new life. With the border behind me it's full steam ahead. In case you're wondering about the knitting chickens bag it's made by Michele at Three Bags Full. You can find this bag and other fun fabric bags on the Dirty Water DyeWorks website. This has been a good winter for ice. I've watched ice form and change shape with each storm. This sheet of ice caught my eye. 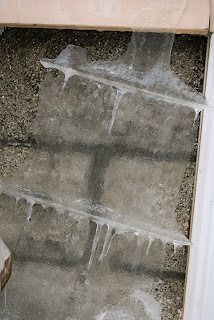 There are tiny little icicles hanging off the ice ridges. The whole thing is a frosty looking glass to the wall behind and is my color inspiration for the week. ~ Knitting meets chemistry. Prof. Crum Brown was not only a chemist but also a knitter. In 1883 he created a three dimensional molecular model out of knitting needles and balls of wool. You can see his model and read about it here. ~ More from the area of science and technology. Have you ever wanted to use your touch screen out in the cold and found that you have to take off your glove? With conductive thread you can now use your touch screen and keep your glove on. 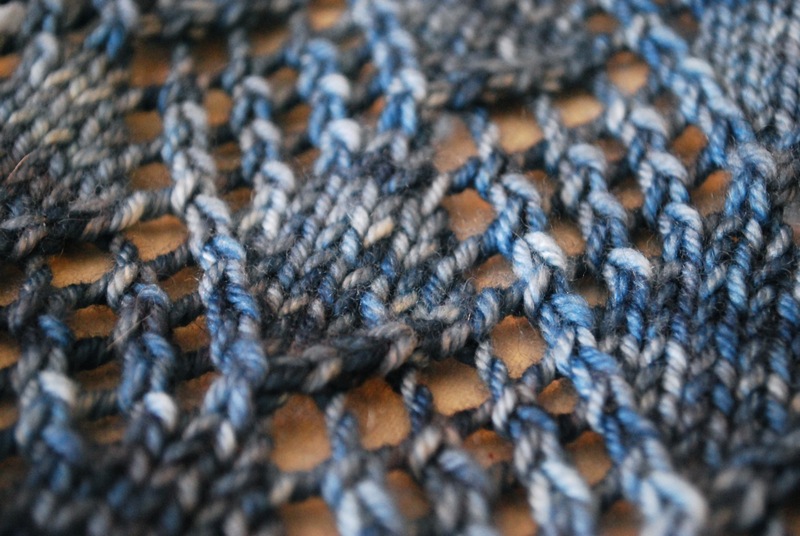 Read about Laura Nelkin's experiment with conductive thread. I can't wait to try this myself. ~ If you know of a knitter or crocheter who's trying to cover tuition, take a look at the Beans for Brains Scholarship. This is a great opportunity for some deserving students. Spread the word. 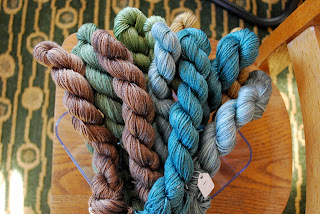 ~ There's a fundraising project underway for The Spun Monkey Dyeworks and Lounge. Take a look, contribute if you can, tell others. 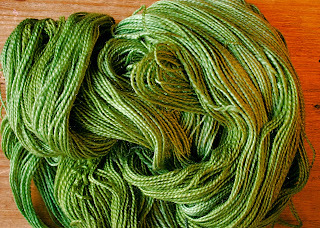 You can read more about The Spun Monkey here. ~ Finally, how would you like to have this for a garden? 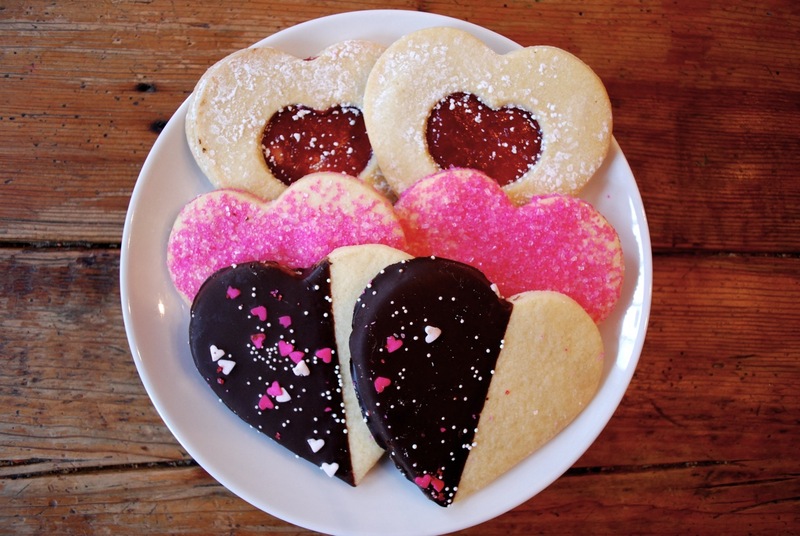 It's sure to bring a smile to your face. It's a new week and a new project. I started this over the weekend. 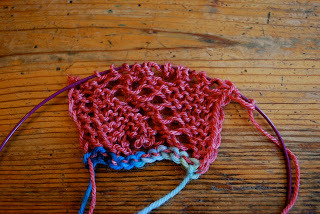 This is the very beginning of Scroll Lace Scarf by Ysolda Teague. The blue colored yarn indicates a provisional cast on. This cast on creates live stitches that can be picked up and worked later. 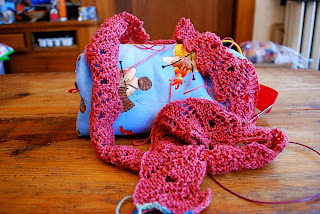 There are different methods for creating a provisional cast on - crochet a chain and pick up stitches, looped cast on using two different strands of yarn, looped cast on using an extra cable instead of waste yarn. My favorite provisional cast on these days is the chained cast on. 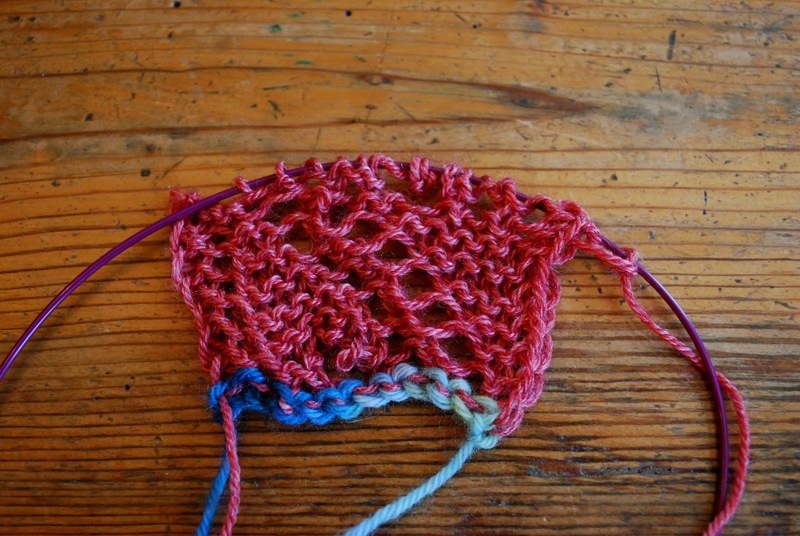 It has the same result as the crochet chain method but doesn't require picking up stitches. 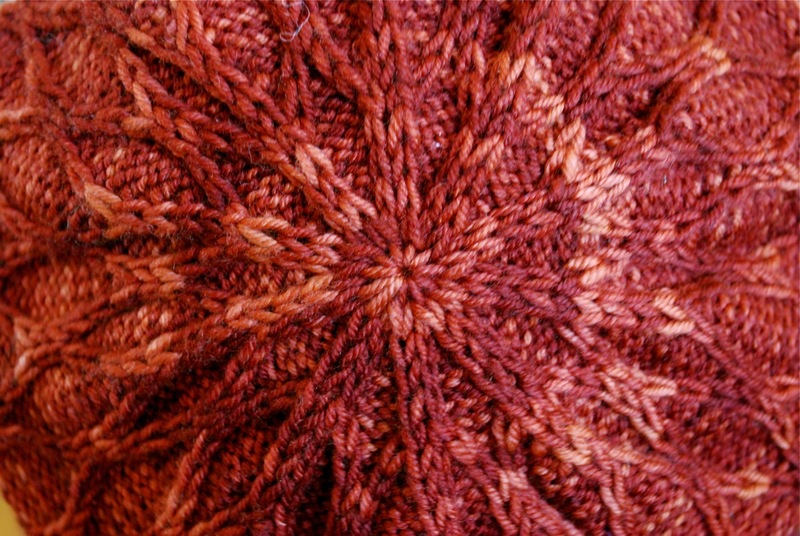 In this pattern the border is worked first. 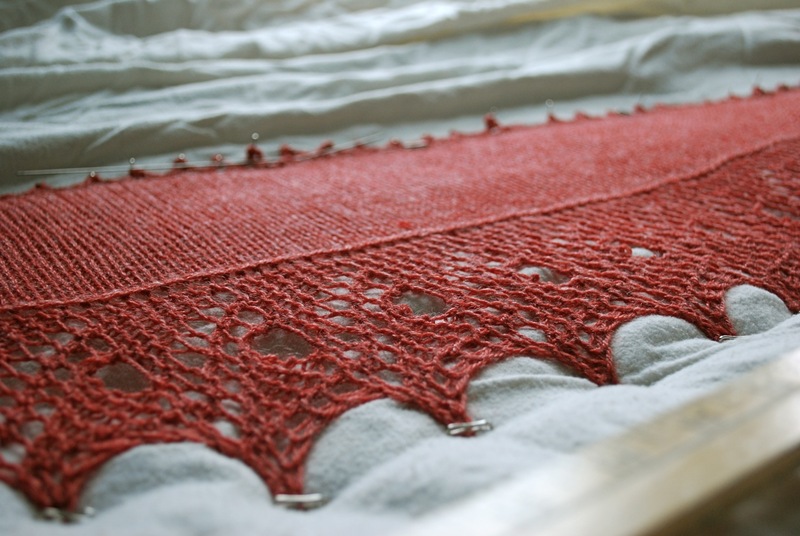 After the border is done, stitches will be picked up along the border edge and worked for the body of the shawl. 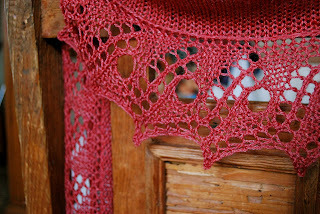 A long strip of swirly lace. 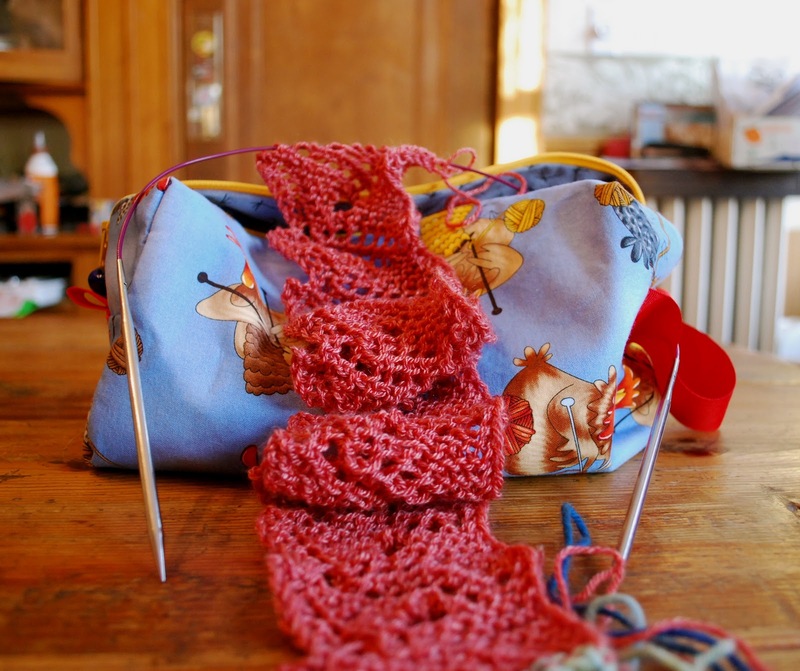 I worked back and forth, back and forth on fewer than twenty stitches. While I feel I should have miles and miles of border, I'm only half way done. Borders can be deceptive that way. 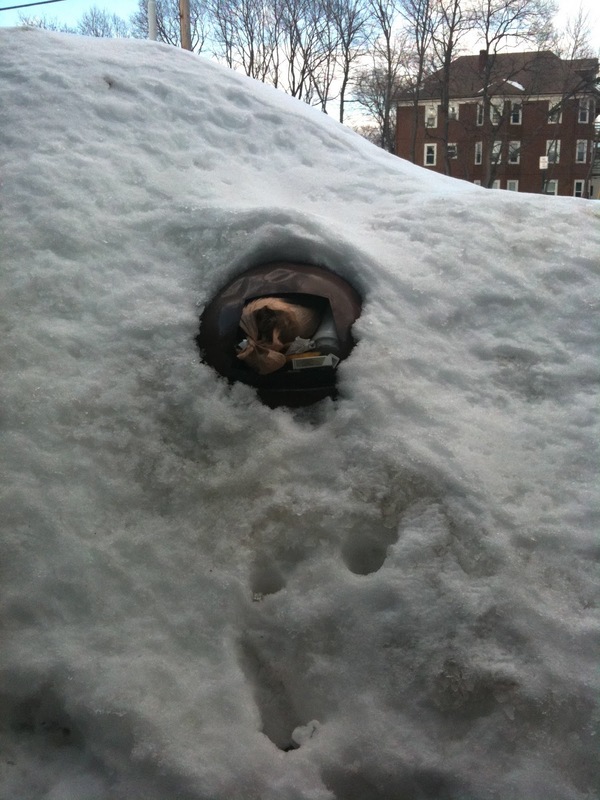 Here's a visual for the amount of snow we have. I spotted this buried trash barrel along the sidewalk. My latest project came off the needles the other night. I caught my second wind and decided to make the most of it, so this scarf took a bath and went right on the blocking wires. I'm in love with everything about this scarf. 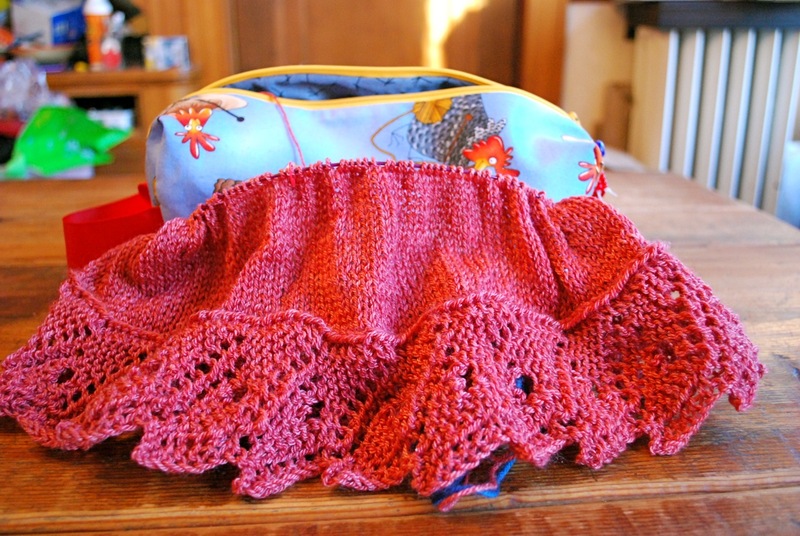 The pattern is Punch and Judy from Anne Hanson at Knitspot. This design had just enough going on to keep me interested without taxing my brain too much. Anne's patterns are well written and easy to follow - this one was no exception. And it was a fast knit. 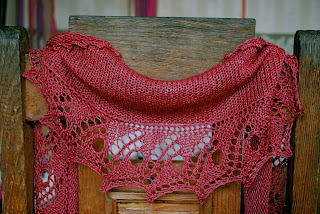 I'm going to add this pattern to my list for quick gifts. I can't say enough good things about the yarn. 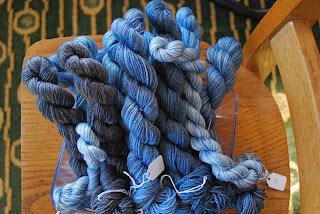 This is Marie from Dirty Water DyeWorks, colorway Blue Jeans. Marie is a DK weight yarn - a blend of 80% Superwash Merino, 10% Cashmere and 10% Nylon. This blend is soft, squishy and delicious. 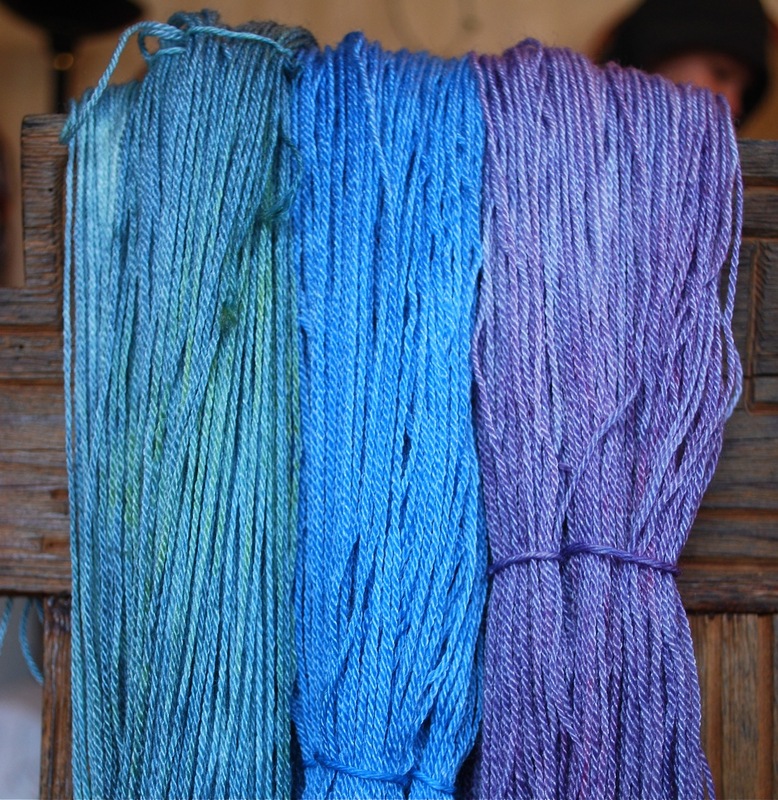 Marie has excellent stitch definition and takes the dye like a sponge, producing colorways with rich variation. 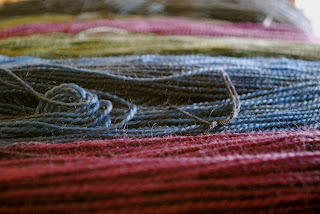 I'm smitten and want to knit another project with this yarn. I see a sweater in my future. In other news the Dirty Water DyeWorks website has been updated to include a line of knitting bags from Michele at Three Bags Full. Two styles are available - the Mia Bag and the Project Bag Set. Michele uses fun, quirky fabrics and incorporates nice details like zipper pulls with handmade glass beads. Take a peek. We had more snow this week but also some clear, bright days. 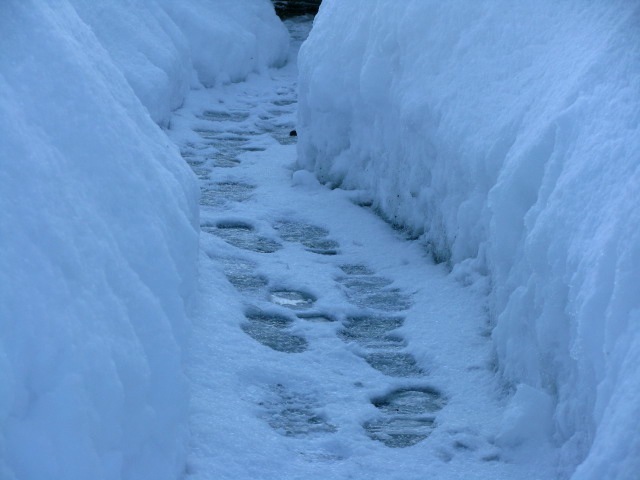 This narrow path has replaced the sidewalk that runs by my house. Late afternoon light transformed the snow and is my color inspiration for the week. A long time ago I learned to always take a knitting project with me when I leave the house. 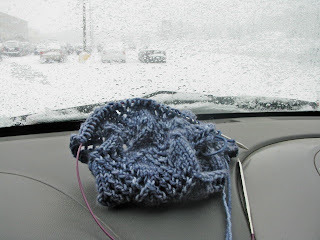 Even when I'm absolutely sure I won't have time to knit, I just never know when I'll be delayed with an unexpected wait. Life happens, and it's good to be prepared. 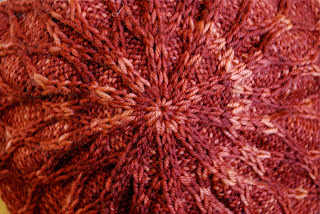 Knitting takes the edge off when someone else is messing with my time, and I have to wait. Yesterday was one of those days. I had to go out to fulfill a family obligation. 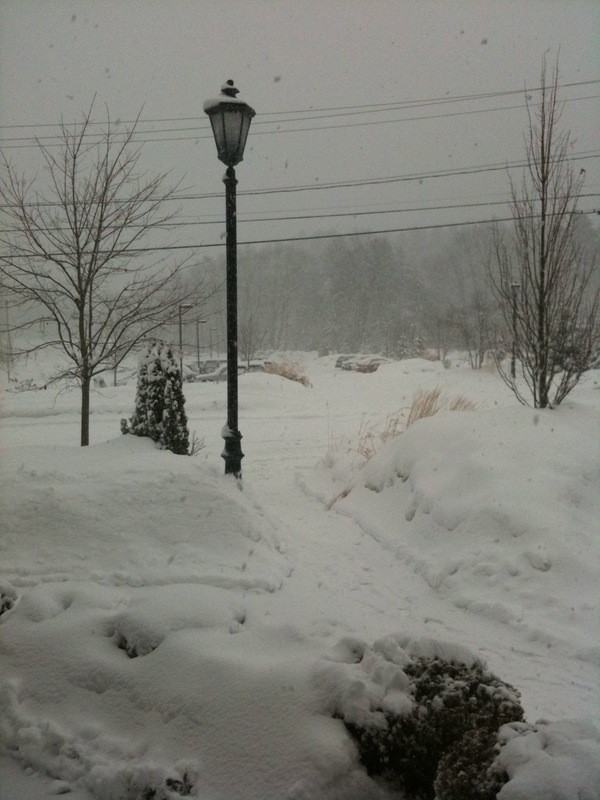 The weather was bad, the roads were treacherous and I was doing the driving. Surely there wouldn't be any time for knitting, but like a trained soldier I took a knitting project with me as I left the house. Just in case. We made a stop along the way. The stop took longer than anticipated, but I was cozy and content, waiting and knitting. Last night found me knitting at home instead of out at knit night which was cancelled due to bad weather. Knit night out is good because I knit and nothing else. 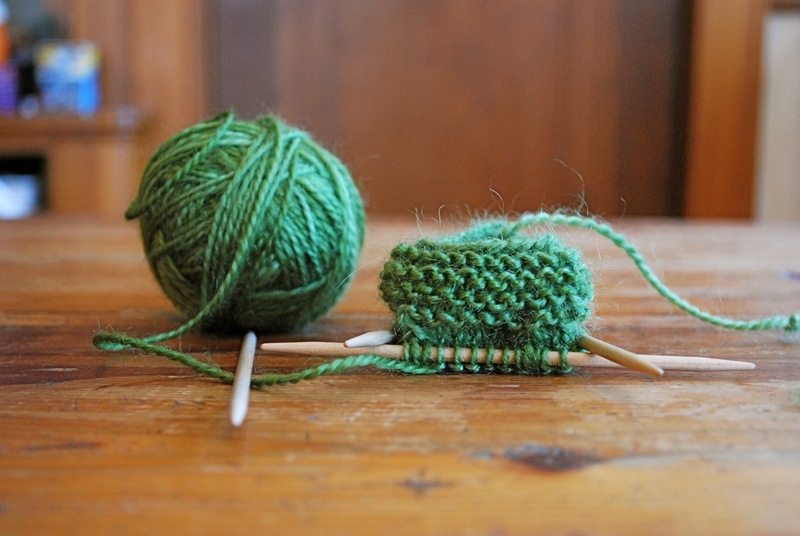 The only thing to do is knit and talk, and usually I can do both of those things simultaneously. Most of the time I get a lot accomplished. Knit night at home isn't always as productive because there are too many distractions. In spite of the distractions I made good progress last night on my latest project. This scarf is now in the home stretch with just a few repeats left. A good example of why I don't leave home without my knitting.